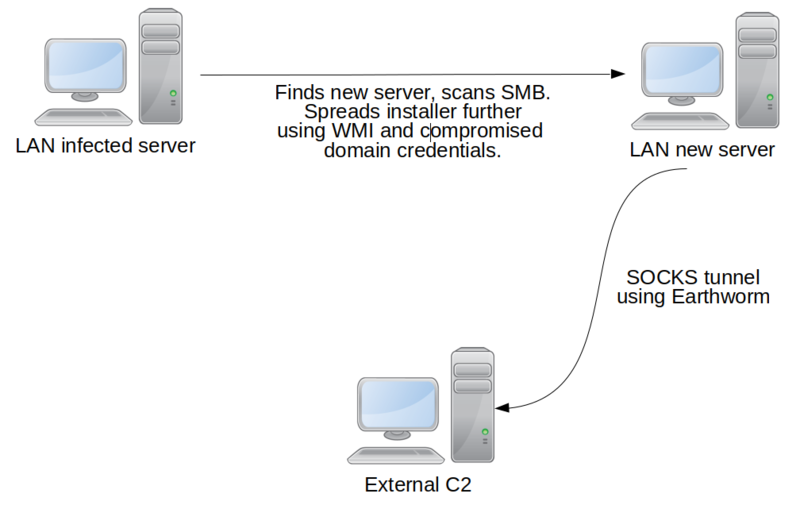 The installer creates a semaphore (name depending on configuration) Global\Door-ndisproxy-mn and checks if the service (name also depends on configuration) ndisproxy-mn is already installed. If it is, the dropper writes “door detected” in load.log. The autorun Windows service running NDISProxy is the “door” in developer terms. The installer also decrypts (using the same DES) the shellcode of the last stage Trojan and saves it in three registry values named xxx0, xxx1, xxx2 in key HKLM\SOFTWARE\Classes\32ndisproxy-mn (or 64ndisproxy-mn for 64-bit hosts). The encrypted configuration is saved as the value filterpd-ndisproxy-mn in the registry key HKCR\ndisproxy-mn. The driver again checks if the Windows version is higher than Vista, then creates a device named \\Device\\ndisproxy-%s (where the word after “-” varies – see Appendix for all variants) and its corresponding symbolic link \\DosDevices\\Global\\ndisproxy-%s. 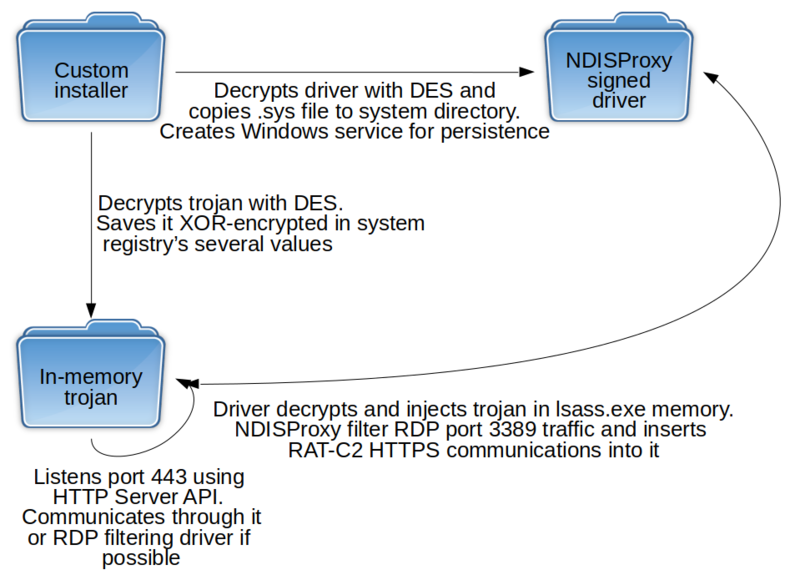 The driver combines all the Trojan-related registry values from HKLM\SOFTWARE\Classes\32ndisproxy-mn and de-XORs them with a six-byte hardcoded value. 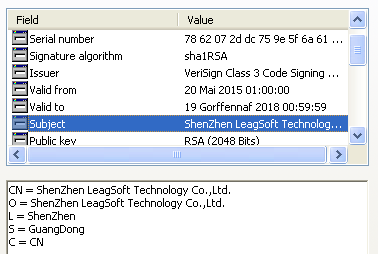 It then injects the resulting Trojan executable shellcode into lsass.exe memory using Blackbone library functions. Subject ShenZhen LeagSoft Technology Co.,Ltd.